The SD-1 has great tone to start with. As with all of Robert Keeley’s modifications every component that is added is of the highest quality. Metal film capacitors are used in the SD-1 modification to provide the smoothest mid-range and high frequency. The overall bass response of the pedal has been increased as well. Metal film resistors are used in all of our changes to give each pedal a consistent sound with extremely low-noise. In addition we have improved the BOSS switching making it even closer to true-bypass! The SD1 Ge modification includes a two-way gain switch that lets you select between two different diodes for the clipping/distortion section of the pedal. The “down” position selects a germanium diode (the “Ge” part of the name). The Ge diode clips the signal more than a standard silicone diode. 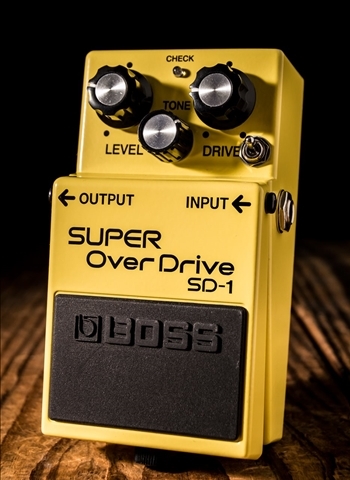 This provides a more saturated, compressed, and smoother sound with more distortion available. The “up” position selects an LED for the clipping section, which clips less, allowing a clearer, more “open” sound, with less compression, more dynamic response, and more available output. Both are asymmetrical and both are an attempt to make the pedal more “tube-like,” since tubes and transformers rarely produce a symmetrical distortion.